The king and queen vs. king checkmate ​is one of the most basic endgames in chess. Knowledge of this and other "overkill" endgames is crucial to improving your chess. After all, it isn't enough to gain a winning position—you need to be able to checkmate your opponent's king. From the position above, White's first step should be to limit the Black king's area of movement. The queen is ideal at sealing the king into a small area. White can begin to limit Black's king by playing 1. Qe5. Black's king is now boxed in, and will never advance to (or beyond) the marked squares in the diagram. This illustrates an important point: it is not always best to check the enemy king. It is often best to instead trap the king and limit its movement. Remember that checkmate is the goal, not simply random checks. Black must make a king move; 1. ... Kd7 is as good as any. How can White continue to make progress towards limiting Black's king? With 2. Qf6, White continues to limit the Black king's movements. White's next few moves will continue to follow this same strategy. Black will attempt to stay away from the edges of the board for as long as possible with moves such as 2. ... Kc7. The chase might continue with 3. Qe6 Kb7 4. Qd6, after which Black must give up ground. Black's king will now have to move to either the a-file or the 8th rank. In either case, White has accomplished a major goal by driving the Black king to the edge of the board. For our example, Black will play 4. ... Kc8. Once the enemy king has been pushed to an edge, it's important to make sure he stays there. We accomplish this by placing our queen on the "second line"—the rank or file next to the one on which the enemy king is trapped. For instance, in this example, the Black king has been forced to the 8th rank. In order to ensure the king stays put, White correctly moves his queen to the 7th rank by playing 5. Qe7. Black's king is now reduced to shuffling between c8, b8, and a8. The queen cannot checkmate an enemy king by herself. Instead, the king and queen must work together to finish the game. At this point, there's no need for White to move the queen again until he's ready to checkmate the Black king. Instead, he can bring his king closer to the action while Black is reduced to moving his king back and forth with moves like 5. ... Kb8 6. Kc4 Kc8 7. Kc5, which brings us to the position diagrammed above. Black's only legal move is 7. ... Kb8. Before executing the checkmate, the stronger side should move their king to the third line—that is, two ranks or files away from the enemy king—as near the enemy king as possible. When checkmating with a king and queen, having the kings directly opposing each other or separated by a "knight's move" will work. In the diagram above, white has accomplished this after 8. Kb6 Kc8. White now has a checkmate in one move, which you should spot before continuing to the next page. White wins the game by playing 9. Qc7#. As simple as this endgame may appear, there are a couple of traps you should watch out for. Two stalemate possibilities exist, which can turn a certain win into a draw. The first stalemating threat occurs when the enemy king sits in one of the corner squares. In this case, it is crucial not to place your queen a knight's move away from that corner! In the diagram above, the White queen prevents the Black king from having any legal moves because it sits a knight's move away from the a8 square, on c7. It would also be a stalemate if the queen were on b6. The easiest way to avoid this stalemate is to make sure the enemy king has at least two safe squares before trapping it in a corner. For instance, if the White Queen were on d7, the Black king could harmlessly shuffle back and forth between a8 and b8. In the diagram above, the White king and queen are working together to stalemate the Black king. 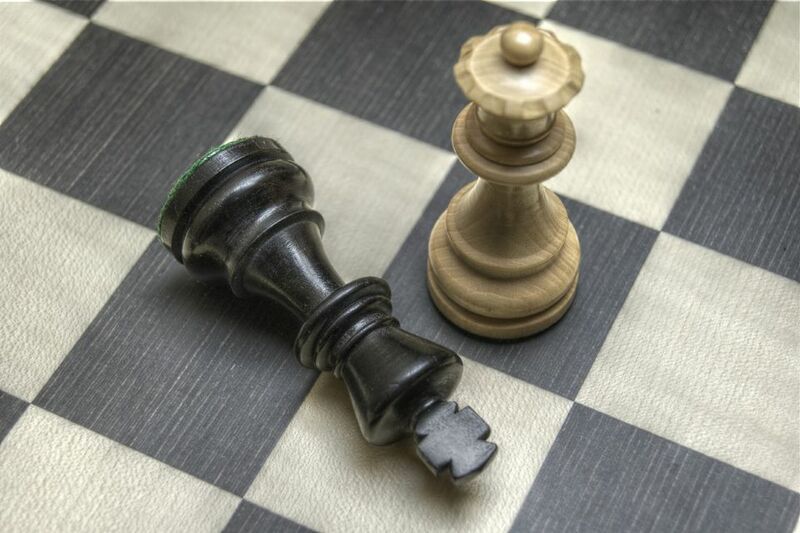 This stalemate can be easily avoided by remembering one of our steps for performing this checkmate: when the enemy king is driven to the edge, make sure to move your queen to the second line. If White's queen were on the 7th rank, there would be no threat of stalemate in the above position.